As mentioned in previous posts, the Taskforce offered a range of workshops during its sector forums in Newcastle, London, Bristol and Birmingham. In the latter 3 venues, not all the people at the event could attend all the sessions, so the Taskforce is using this series of blog posts to enable everyone to see the presentations and get a flavour of the discussions that took place. The LGA organised for Jessica Harris, Cultural Commissioning Programme Manager at the National Council for Voluntary Organisations to run a workshop on commissioning at our Birmingham sector forum. It was held twice with 35 people taking part. This session covered what commissioning is, how to develop an offer and how to evidence that offer. Before starting the formal presentation, Jessica did a brief survey (show of hands...) about which library services represented in the room were already being commissioned. There was widespread recognition that libraries are doing a lot of work which deliver local authority outcomes, but most aren’t being formally commissioned to deliver these services. Library services need to be more proactive in this area. Jessica then moved on to a short presentation on the cultural commissioning programme, outcomes which arts and cultural providers help deliver, and case studies of how commissioning has been done successfully. 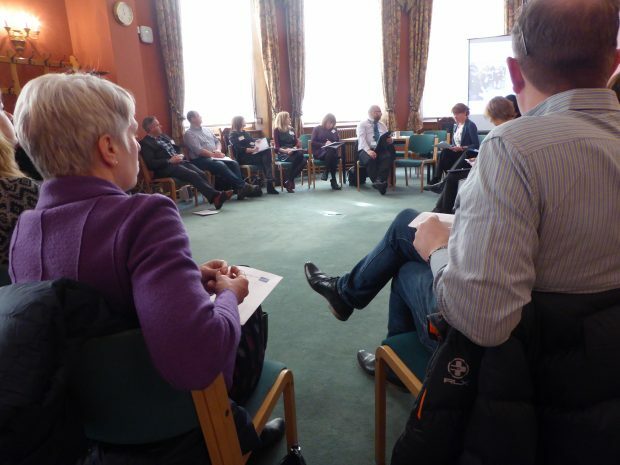 This was followed by a discussion where people shared their experiences and questions around commissioning. The commissioning cycle Jessica ran through (as shown in slide 3) is a perfect model - not all will look the same. She suggested people encourage their commissioners to talk through their model. What are the priorities for commissioners? The group talked about local commissioning and opportunities for alignment with local authority outcomes (slide 4). Work published by the Cultural Commissioning Programme involved a ‘mapping’ exercise to identify where arts and cultural organisations are working with specific beneficiary types and outcome areas likely to be of interest to commissioners. This showed that the arts and cultural sector can deliver on a wide range of outcome areas, but particularly in mental health and well-being, and education and learning. One way to frame the outcomes a library service can deliver to commissioners is to use the 7 Outcomes in Ambition, and SCL’s Universal Offers. What work do libraries do which aligns with commissioners’ outcomes? Jessica talked through the theory of change which is commonly used in the charity sector but less so in the cultural sector. The objective is to look at the outcome or impact of a programme rather than the activity itself. Have a look at New Philanthropy Capital for more information on it. Jessica suggested that it’s often worth framing the impact of libraries through the intermediary outcomes, eg. impact on employment. It’s difficult to track long term employment, but we can track and measure the library input like improved knowledge of the job market, improved skills (in CV writing) and improved confidence at interviews. We could say that employability is a tough goal to reach until these intermediary outcomes have been met. When considering these outcomes, services should look at internal enablers (capacity, skills, etc) and external ones (partnerships) which can be used to redesign existing services. Many pointed out that there is often a lack of inter-relationships within councils and there isn’t always an obvious way to engage with commissioning structures. One way to combat this was to go to the market engagement sessions which councils run and find the right people to have these conversations with. Kathy Kirk from Worcestershire talked about her experience of being commissioned by another service within the local authority. She said how they had learnt a lot by attending a market engagement session and it was a really good opportunity to listen to the way in which commissioners try to engage with the sector. They also learned how the commissioners can split up the larger tenders into smaller, more specific parcels of work. 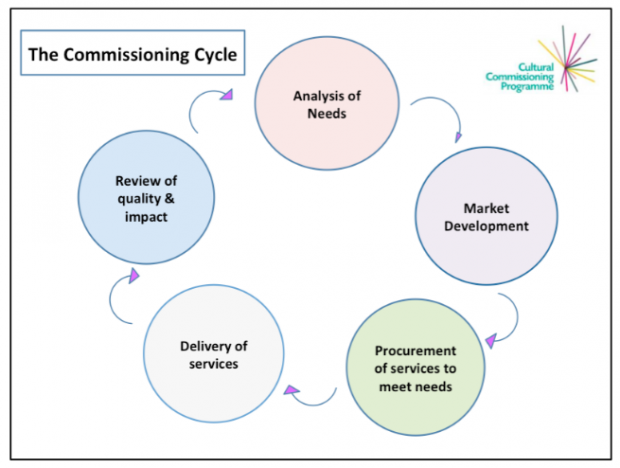 Kathy reflected on how the process can take a long time as commissioning cycles tend to be quite long, but they have had examples of commissioners coming to them (and asking if they can do x, y or z). She also mentioned that some commissioners are concerned that the market is so underdeveloped, there aren't enough suppliers to deliver the work so are often keen to talk to providers. The Theory of Change which Jessica had mentioned in her presentation stimulated a question on whether there were any lessons to be learnt from the charity sector and their application of it. The theory of change was originally designed to address the disjoint between planning and outcomes - it’s easy to identify both ends of the process, but more difficult to see the links or stepping stones to get there. For example, all library services run the Summer Reading Challenge and know what they’re trying to achieve. But with the theory of change, you’d focus on the outcomes you wanted to achieve before planning the programme of activity. Using the outcomes as your starting point, you’d work backwards and find the gaps in your activities / capacity which could stop you achieving the desired outcomes and getting maximum impact. With this process, there is always the option to discard activities which have previously been done. This will involve making assumptions, but you can test them. Libraries often limit data around events to the number of attendees. One service had made some short videos with mothers who attended rhyme times which instead focussed on demonstrating a number of outcomes. This topic was explored more in the core dataset workshops - look out for our blog on this next week. One point which came up a lot was the difficulty of putting a value on the social / community benefit which libraries deliver. There is an increasing need for libraries to be able to tangibly measure their social value within their authorities. The Social Value Act could offer an opportunity for libraries to speak to their authority and commissioners as the Act puts a requirement on councils to consider the social impact of their services. Councils are building in a social value element to their services; for example, Kent County Council built into their refuse contract that it had to have a social value and cultural element. More information, including resources and case studies, to support cultural commissioning is here. If you have any views to share on this topic, please either email us or leave a comment below. To keep up to date with Taskforce activities, remember to follow us on twitter, or subscribe to our blogs.